The Full Speed Ahead Orbit CF-40 brings integrated standard headsets to tapered head tube applications. The Orbit CF-40 tapers from the standard 1-1/8″ diameter at the headset upper to 1-1/2″ diameter at the lower. 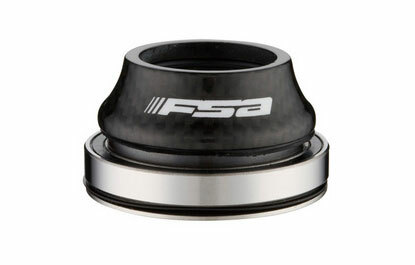 The headset features 45/45 degree angular contact bearings and a carbon fiber top cover. Has a 17 mm stack height. Weighs 84 grams.